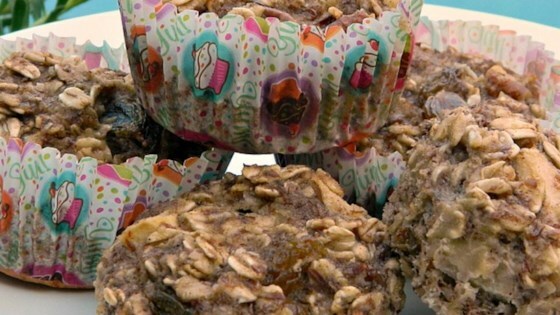 "Old-fashioned oats are baked in a muffin tin with apples, nuts, and spices to create a tasty breakfast that can be eaten immediately or frozen and reheated as needed." Mix almond milk, applesauce, apple, raisins, pecans, flax meal, eggs, brown sugar, cinnamon, and nutmeg together in a bowl; stir in oats until well mixed. Let sit for 5 minutes. Scoop mixture into the prepared muffin cups using an ice cream scoop. Bake in the preheated oven until lightly browned, about 20 minutes. Let oatmeal sit in muffin tin for 5 minutes before transferring to a wire rack to cool completely. I like to make large batches, let them cool completely, and freeze them. If I pop a frozen one in the microwave for 1.5 minutes, I have a deliciously healthy breakfast ready in no time!